What if a node or edge of a network fails? What if traffic between two nodes grows or shrinks? Clearly this is a case for distributed algorithms! After all, the Internet and its protocols are decentralized by design. Thanks to redundancy and distributed communications, Paul Baran suggested that the Internet could operate even if many of its links and nodes had been destroyed by a “nuclear attack”. However, it turns out that distributed control leaves quite some efficiency on the table. Recently several companies started to organize their enterprise networks in a centralized fashion, separating data and control planes by means of software-defined networks (SDNs). So we might soon see a world where a (possibly fault-tolerant but nevertheless) centralized controller is making all routing and transport decisions, using SDN-switches to implement these decisions. 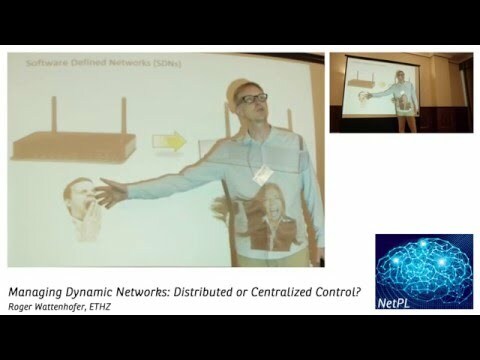 Is this the death of distributed network protocols? Will this simplify controlling (and ultimately: programming) networks, since there are no more concurrency problems? Roger Wattenhofer is a full professor at the Information Technology and Electrical Engineering Department, ETH Zurich, Switzerland. He received his doctorate in Computer Science in 1998 from ETH Zurich. From 1999 to 2001 he was in the USA, first at Brown University in Providence, RI, then at Microsoft Research in Redmond, WA. He then returned to ETH Zurich, originally as an assistant professor at the Computer Science Department. Roger Wattenhofer’s research interests are a variety of algorithmic and systems aspects in computer science and information technology, currently in particular wireless networks, wide area networks, mobile systems, social networks, and physical algorithms. He publishes in different communities: distributed computing (e.g., PODC, SPAA, DISC), networking (e.g., SIGCOMM, MobiCom, SenSys), or theory (e.g., STOC, FOCS, SODA, ICALP).